----Source: 1881 History of Northern Wisconsin, page 1027. 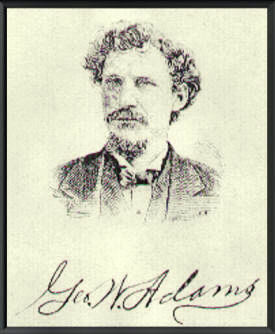 G. W. ADAMS, attorney, Medford, was born in Oxfordshire, England, March 4, 1846. His parents came to Wisconsin in 1851, and located at Beaver Dam, when that place was nothing but a trading post. He had no advantages for an education, and went to school when about fourteen years of age for the first time. He enlisted in the i6th Wis. V., Co. C. Four of his brothers were in the army, and one was killed at the battle of Atlanta, July 22, 1864 He was mustered out in 1865, and made a visit to "Minnesota, but came home to Dodge Co., Wis., where his parents are living yet. He next went to Waterloo, and entered Prof Hall's Academy, and then attended the Lake Mills High School, in Jefferson County. He worked during the Summer at farm work, to get; the means with which to go to the Beaver Dam University. In 1868-9, he went to the Madison University till he had advanced to the senior year, but on account of his health was obliged to discontinue his studies at that time. He returned, however, in 1873, and graduated from the law department, and that Winter taught school in the town of Lowell, where he commenced his career. He went from Stevens' Point to Waupaca, where he entered the law office of Judge Ogden, when he and the Judge's son came to Medford and edited the Taylor County News. He opened a law office, and is now in the real estate and general law business. In 1877 he married Miss Augusta Stewart, of Danville, Dodge Co. They have had two children: Ellen Maud, who died when ten months old, and Florence Ethel, born in 1880. Mr. Adams was the first Chairman of the County and Town Boards here, and has been Court Commissioner for six years. He belongs to the Temple of Honor and the Colby Lodge of I.O.O. F. He has a fine farm on Sec. 35, of 120 acres; also owns town property.